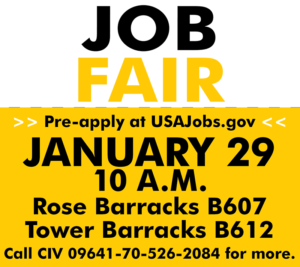 GRAFENWOEHR, Germany — U.S. Army Garrison Bavaria’s Family and MWR hosts its 2019 job fair, Tue, Jan. 29, for both Tower and Rose Barracks. The purpose of the 2019 job fair is to assist active duty service members, family members and dependents find employment while serving overseas. The application submission process will begin at 10 a.m. and conclude at noon. The interview selection process is from 1 p.m. – 3 p.m. Applicants are encouraged to pre-apply at USAJobs.gov. For additional information please call CIV 09641-70-526-2084, 2083 or 2081. Listed below are locations, available positions, and what you are expected to bring. Interview selection process, 1 p.m. – 3 p.m. Remember to pre-apply at USAJobs.gov to have an expedited interview process. Click on the position below to pre-apply.